Each year ACM SIGUCCS sponsors a competition to honor the best publications, websites and promotional material produced by university and college centers. A list of past winners can be seen below. The competition recognizes excellence in developing useful and attractive publications in a variety of media categories and provides SIGUCCS conference participants with an opportunity to review publications that may help them develop or enhance their own work. The winning entries will be displayed during the conference for perusal by the conference participants. Your entry must be developed by staff affiliated with your college or university. Institutions may enter up to three entries in each category. An institution may not enter a category judged by one of its staff or faculty members. Note: The “Best of Category” winners in each category will be asked to judge the Communication Awards next year. Nominations will be accepted via this form. 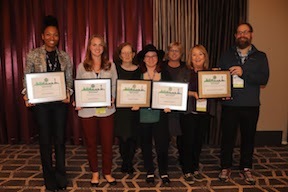 Awards will be presented at the ACM SIGUCCS 2019 Annual Conference, November 3-6, in New Orleans, Louisiana. How do I send in my submission? Submissions via URL are encouraged, however they can also be emailed as attachments or physically mailed directly to a judge, if requested. Please make sure that permissions on your submission are set appropriately so that judges can view the materials. Why enter the SIGUCCS Communication Awards? There are several reasons to consider here. How about to receive the adulation of your peers at universities and colleges across the country? Or just the respect and admiration of colleagues at your institution (think how proud your boss will be when you inform him or her you’ve won). Earning an award in a highly competitive, international, peer-juried competition has been rumored to never hurt during times of increasingly tightening budgets, too. Entering also helps to raise the level of excellence for future ACM SIGUCCS Communication Awards. All winning entries are displayed during the annual fall conference, so all conference participants can see your work – which might spark ideas for your colleagues to take back to their university or college, and might give you a chance to take some ideas back home, yourself. Plus all entries receive feedback from the judges, so even if your entry isn’t award-worthy this year, you will get some unbiased peer feedback about what you are doing well and where you might target potential improvements. Where do I send Questions? Please review the FAQs below, and send any questions you may have to the Communication Awards chair: commawards@docs.siguccs.org. Web based submissions should strive to meet accessibility, and W3C standards. Design and layout is appealing, consistent, and functional. The submission meets the needs of the target audience. The length or duration of the submission is appropriate to content. The “Best of Category” award winners will be asked to present a poster to showcase their materials at the conference Poster session. The “Best of Category” winners in each category will be asked to judge the Communication Awards next year. The official presentation of the awards will take place during a general plenary session at the conference. All awardees will be invited to the Awards Reception during the conference. A letter will be sent to the institution congratulating them on the award. The ACM publishes a press release recognizing the award winners. SIGUCCS recognizes the award winners on the conference website. When is the deadline for submitting entries? All entries must be received by June 3, 2019. Winners will be notified by mid-August. Nominations are now being accepted for 2019. Does my submission have to have been made this year to be entered into the SIGUCCS Communication Awards? No. Please feel free to submit any work created within the past two years. May I submit the same piece to multiple categories? Yes, you may submit your work into all categories that are applicable. What should I enter into the SIGUCCS Communication Awards? Take a look at all the categories and then consider entering any website, publication or other promotional material developed by staff or students affiliated with your institution that will fit into those categories. Don’t be too self-critical. Remember, a project you consider mundane might actually be breaking new ground – and spark ideas for other institutions. You also might enter something, just to receive the peer feedback. Hearing the opinion of someone unfettered by the traditions, habits and politics at your institution may cause you (or your boss) to view things in a new light. 1. Computing Services Public/Mobile Website. 2. Computing Newsletter (Print or Electronic). 3. How-To Guides (Print or Electronic). These can be print or online documents that are primarily procedural and provide systematic instructions for accomplishing specific computing tasks. 4a. Instructional Materials (Classroom or Online). This category is for documents that are primarily used to supplement classroom or online instruction in using a particular software application, suite or network service. 4b. Printed Quick Reference Guides. These guides provide a brief format for the audience to learn “the basics” of a service, or to raise awareness of the service’s presence. Quick reference guides are brief, usually only a few pages or shorter, and include formats such as pamphlets, flyers, postcards, bookmarks, and more. 5a. General Service Promotional Materials. Many institutions are publishing information about special projects or services. One function of these publications is to increase the visibility of computing projects and services in their home institution. Example services might include: Training offerings or catalog, departmental support lab, consulting services, support center, and so on. 5b. General Service Campaign Materials. Institutions are creating entire campaigns to promote special events, projects and services, such as security awareness, various IT services for an institution, new student orientation, and so on. Entries in this category will consist of multiple items, and some items may involve the use of different media. 6a. Short Promotional Video/Audio. Included in this category are promotional videos, audio clips, streaming media, podcasts, and so on, that are 5:00 minutes or less in length. 6b. Long Promotional Video/Audio. Included in this category are promotional videos, audio clips, streaming media, podcasts, and so on, that are greater than 5:00 minutes in length. 7. Use of Social Media. Social media is becoming a common form of communication in computing services. Submissions in this category may include Facebook pages, Twitter accounts, Instagram accounts, or other forms of social connection. 8. Student Created Materials. Work created by students may be submitted in any of the above categories, however this category provides an opportunity to specifically recognize and reward the creativity and professionalism of our students. Any work created solely by students or student employees within your institutions that fits into categories 5a, 5b, 6a, and 6b may be submitted here and be judged against other student-created work.